Although I’m something of a tech aficionado, a finite bank balance and not wanting to buy into the next BetaMax often temper my enthusiasm and am forced to resist jumping on the bandwagon. So it was with ebook readers – I always like the idea of having an electronic text, but my PDAs and phones just didn’t provide a reading experience to match the tactility and focus of a real book. Finally in 2009 I was planning a hut-to-hit hike through the Hohe Tauern national park and the Sony PRS-505 was available in stores in Austria. It seemed like a great option – at €250 (including a €50 ebook voucher) it wasn’t cheap, but I managed to convince myself that the prices of ebooks wouldn’t have to be soo much cheaper in order for the savings to add up over time. As purchases go, it was certainly a great investment – it was perfect for the hike, with a charge lasting the whole week and less than the weight of a single paperback. In fact for novels it still provides a good reading experience. In fact the e-ink screen is such a pleasure that I immediately wanted the same for reading journal papers. The reading, annotation, digesting and recalling of journal articles is of course at the centre of much academic life. When I started my PhD (in 2001) this meant laboriously photocopying articles dug out from the stacks in the basement of the library, or ordering an article based on only a title, to find out when it arrived several weeks later that the contents bore little relevance. With the advent of online journals, and the extensive efforts to scan and OCR even old articles, this has become a lot easier. In turn my reference collection has moved from a filing cabinet filled with dog-eared and yellow highlighted photocopies to a database in Zotero, magically sync’d with my all of my computers and the web, with PDFs of each article attached. Having got all of these articles (far more than I can ever hope to read – this is, of course, the curse of digital accessibility), I now want to be able to (a) read them and (b) annotate them. All, of course, digitally (I try to lead a paperless life). A few years ago I made the switch to reading and annotating “on screen”. The PDF standard has evolved to allow all of the annotations I would want to make (sticky notes, highlighting, underlining etc.). Although there is a dearth of good PDF viewers with annotation support for linux (but evince is slowly getting there! ), I used to use PDF-XChange in my Windows days. Happily this also works under wine; it’s not the open source solution I would prefer, but it works well. make annotations which are stored back in the PDF format. Unfortunately there are no devices (that I have found, at least) ticking all of these boxes. There are some large format readers (9 and 10″) which support PDFs (the Onyx Boox M series, for example, or the Asus Eee Reader DR900), but none support writing PDF annotations in the PDF format. If anything, separate note files are created. Sure, I could export these and re-combine them with the PDF, but this won’t allow the full set of annotations I’m used to. Now, before you tell me to buy an iPad… of course I could use a tablet – I have a re-purposed Nook Color running CM7 and the ezPDF reader. This is great for sitting at indoors at home, but one of the reasons I want this device is to just grab it and read anywhere – in particular outside, in the park, up a mountains – without worrying about sunlight or battery life. So e-ink is, for me, a must. For now I’ll stick to my Sony PRS-950 – it doesn’t do PDF annotation, it’s not 9/10″, but it is a great all-rounder, with a reasonable screen size and it has a 4×4 reading mode that splits a page into for parts and lets one swipe through them; for most journal papers that are written in two columns, this is at least a start (see the video review above from The-Ebook-Read.com)! There’s still hope – the digital textbook market is enormous, but I fear this will go the iPad route. On the other hand, the hardware already exists – we just need software. Fortunately the development community is trying to make these devices better, and third party ebook firmwares are starting to appear, such as OpenInkpot and OpenBoox… so watch this space! This entry was posted in Science, Technology and tagged academia, ebooks, open source. Bookmark the permalink. 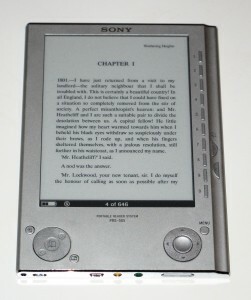 10 Responses to "In search of the perfect academic ebook reader"
I am on the edge of buying the Sony PRS. I’m in grad school and the amount of research articles is driving me crazy. I would also like to read outside, so even though I’m a mac girl, no iPad for me. I was under the impression that you can annotate on the sony device. Am I mistaken? Hi Carolyn – are you looking at the PRS-T1 (the current version) or the 950? Sadly I cracked the screen on my 950, and replaced it with the T1. It still has fairly good PDF support, including the 4×4 split, although it’s not quite as good as the 950. Both support annotations, but they don’t write directly back into the PDF, but as an extra file. There are some ways around this – there is a package called PRSannots (https://github.com/rschroll/prsannots/) which claims to write annotations made on the PRS back to a merged PDF file on your computer. I haven’t tried it yet, but along with zotero and zotfile it looks like one could make quite a capable “everything, everywhere in sync” solution! If you find a better solution, I’d love to hear about it! Are yo try root the nook simple touch? In my experience is the most close alternative to this type of requirement. It´s not perfect, but do a good work for my expectations. I just came across this version of the Icarus Excel… it actually looks rather promising since the annotations can be written into a PDF clone and then exported. Not sure on the overall usability yet, but am considering that one. Here’s a separate review on it. It looks interesting – I read the review you post, and it seems that the cloned PDF supports drawn annotations (I suppose it creates a layer with your annotations), but doesn’t actually write annotations in the PDF format – so this is still not quite quite I’m looking for – but it’s getting close! Any updates on your quest? Your wishes match mine 1 to 1. This is exactly what I’m looking for too. Really hope something comes out soon which will (reluctantly) enable me to replace my crumbling library and hoards of notebooks festering with dog-eared post-its, scribbles, asterisks, circling etc. Please keep me posted! nothing yet? looking exactly for the same too!